The EXA AUTO CLEAN chemical cleaning system automates the acid cleaning process, which not only saves both time and expense but also ensures precise pH measurement over long periods. In the flue gas desulfurization system, Mg(OH)2 is used as the absorbent to remove sulfur dioxide (SO2) from the flue gas. 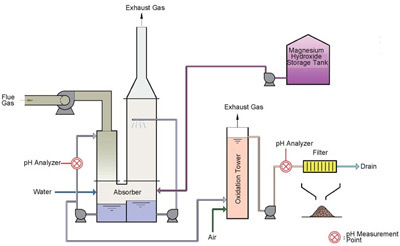 After absorbing SO2, the solution undergoes pH adjustment, oxidation, and filtration for detoxification before discharge. 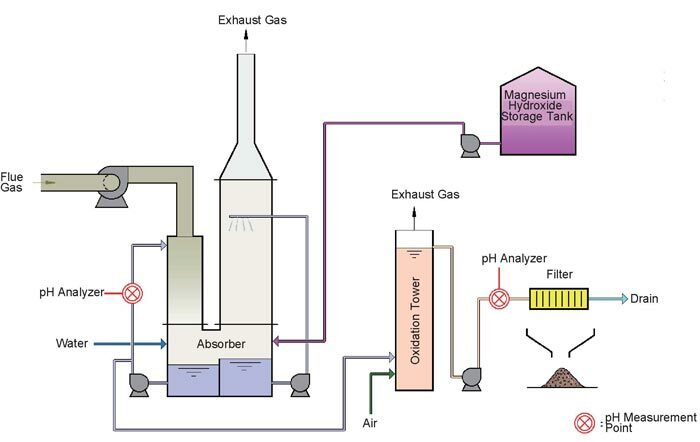 When performing pH measurement in a flue gas desulfurization system with Mg(OH)2 slurry, the electrodes tend to become heavily stained by the slurry. The cleaning of the electrodes and the reduction of maintenance time and cost are key points to consider when selecting a pH analyzer for the system. "Automatic acid cleaning: 2 or 3 times/day, user programmable Manual acid cleaning: approx. monthly" "Manual acid cleaning: once/day"
Manual calibration: weekly "Manual 2-point calibration: weekly"
Acid cleaning is done with a 4% hydrochloric acid solution. The SC25F is a digital SMART pH sensor in a 12 mm design that includes an integral temperature element and a Liquid earth electrode. The SC25V is a pH sensor in a 12 mm design that includes an integral temperature element and a Liquid earth electrode.